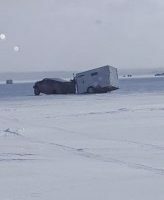 The sturgeon spearing season got underway this weekend on the Lake Winnebago system. DNR fisheries biologist Ryan Koenigs says people need to be careful when venturing out on the lake this year. “I have heard quite a few reports that there are more pressure cracks than what there normally are,” Koenigs said. Koenigs says water clarity varies, but all indications are the season will probably go the full 16 days. Koenigs says he expects some big fish to be harvested this year.